Changpeng Nontasin of Thailand won the fourth stage of the National Women’s Cycling Open, or the An Giang Television Cup, yesterday. Nontasin triumphed in the 114km race from Phan Thiết City in Bình Thuận Province to Long Khánh Town in Đồng Nai Province in a time of 3:24.45. Nguyễn Thị Thu Mai of Gạo Hạt Ngọc Trời An Giang retained the yellow jersey for the best overall time after four stages, while Jutatip Maneephan of Thailand holds the green jersey as the best sprinter with 39 points. In the team rankings, Gạo Hạt Ngọc Trời An Giang leads with the best overall time of 32:56.58, followed by Biwase Bình Dương and HCM City – Minh Giang. 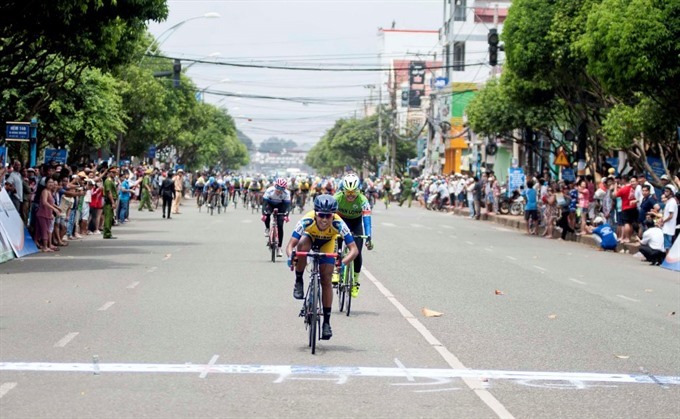 Today, cyclists will compete in the fifth stage from Tân An City of Long An Province to Tiền Giang – Bến Tre – Trà Vinh – Vĩnh Long City, lasting 131 km. The 19th round match of V. League 1 between the top team, Hà Nội FC and low-ranked Nam Định FC, ended in a draw yesterday. The match was held at Hà Nội FC’s home ground, Hàng Đẫy Stadium. In the first half, the visiting players showcased both a firm defensive strategy and impressive counter-attacking capacity while the host did not hastily seek an opener. Both teams entered the break without any goals being scored. 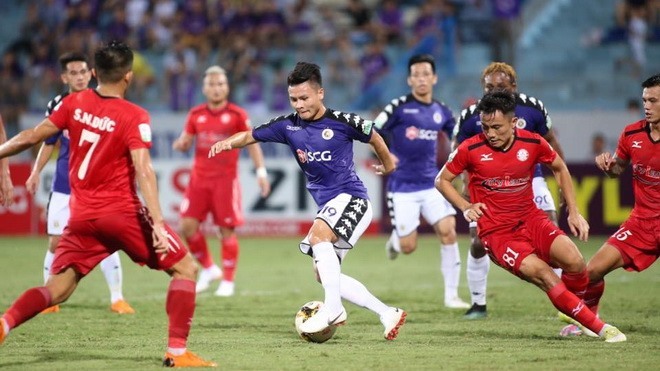 The match was going in an unexpected direction when Nam Định scored three goals past Hà Nội early in the second half, with two goals by foreign forward Diogo Junior Pereira and one from defender Vũ Thế Vương. The goals seemed to wake the host, creating one of the most impressive comebacks in the tournament this year. The last ten minutes of the match saw three consecutive goals by Hà Nội – midfielder Nguyễn Quang Hải, forward Nguyễn Văn Quyết and defender Đoàn Văn Hậu, in the 81st, 86th and 88th minutes respectively, being the score equal. The host also defended well until the end of the game, and even had another opportunity to net a goal. However, the match ended in a draw, bringing each team one point. Hà Nội FC still ranks top of the table while Nam Định ranks third from bottom, above Cần Thơ and Sài Gòn FC. Elsewhere, Thanh Hóa and Quảng Ninh ended 1-1 while Sông Lam Nghệ An defeated Quảng Nam 2-1. 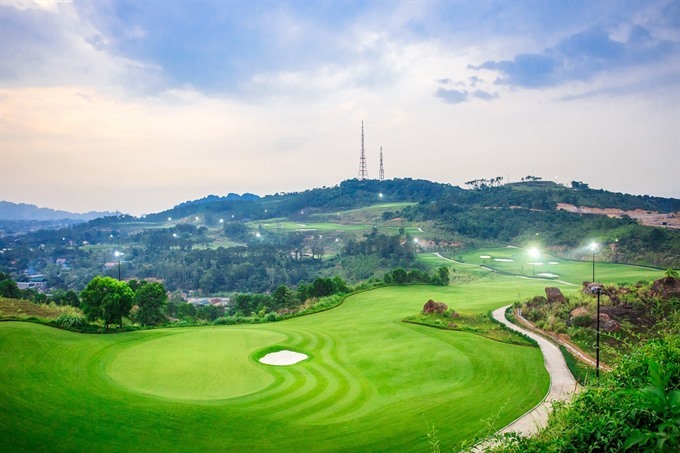 The Bamboo Airways Golf Tournament is scheduled to tee off at the FLC Hạ Long Golf Club in Hạ Long City, Quảng Ninh Province on August 25-26. The event will offer a series of big prizes including luxury cars, vouchers for FLC Biscom golf course and vouchers for FLC group’s resorts. Other prizes such as Nearest to the Pin, Longest Drive, Nearest to the Line and Eagle will be presented to the winning golfers. Golfers entering the tournament will have the opportunity to become the first customers of Bamboo Airways when the airline comes into operation.